We have School Projects Costumes for Wax Museum Kids Historic Characters. When it comes to School Project costumes, nobody can beat us. You can get this Meriwether Lewis Explorer Outfit for School Projects in kids sizes or we have adult sizes Lewis & Clark Outfits too.. 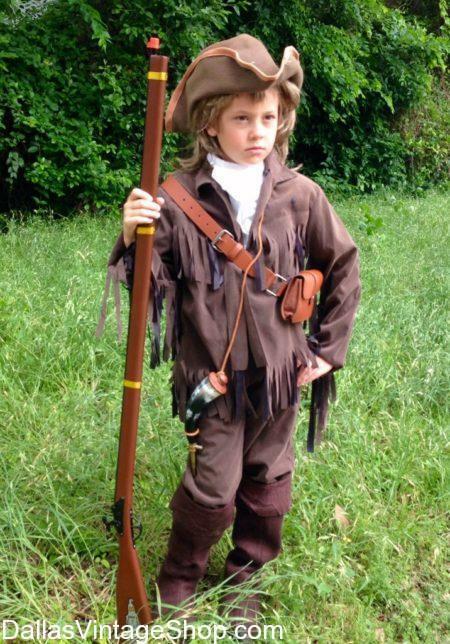 This Meriwether Lewis Child Costume is great for Children’s Historical School Project Costumes. Get Complete Lewis & Clark Explorer Costumes, Lewis & Clark Theatrical or Historical Attire or Lewis & Clark Historical Reenactment Garb. We stock all the costumes & period attire you need to create this Meriwether Lewis Explorer Outfit. We have just about any Historical Character Costumes and Period Attire you can think of. We provide an unbelievable number of Children’s School Project Wax Museum or Book Report Costumes like this Meriwether Lewis Explorer Complete Deluxe Costume. People come from all over the DFW Area & Texas for Quality Child School History Project Costumes. Many of our regular shoppers are from all over the US and from outside of the US. It’s worth the effort. We have super high quality or economy child and adult Lewis & Clark costumes to help you fit your budget. Looking for your Prince Charming Costume? We have excellent School Project Historical Characters Costumes in stock. Create your own fantasy Prince Charming Outfit or dress like an historical Prince. You may want dress like a Disney Prince Charming. We have plenty of Royalty attire for any Prince you can imagine. Get complete costumes of just the pieces you need. We have high quality or economy complete Prince outfits or just the the pieces or accessories you need. Find Adult, Child, Youth and even plus size Prince Charming Costumes. Come Find Very Regal Prince Charming Costumes, School Project Historical Prince Characters Costumes, Cinderella Prince Charming, Historical Ancient Royalty Costumes, Famous Historical Prince Character Costumes, Disney Prince Charming Outfits, Movie & Television Show Prince & Royalty Costumes, Prince Formal Coats, Prince Royal Military Style Jackets, Medieval Prince Costumes, Renaissance Prince Costumes, Fantasy Prince Costumes and more. Historic American First Lady Costumes: Abigail Adams, Eleanor Roosevelt, Martha Washington, Mary Todd Lincoln & More: Childrens History & School Project Costumes Come to Dallas Vintage Shop for all Historic American Woman Costumes, Childrens School Project Costumes & Period Attire for Children & Adults. We have any Famous American Women or Mens Costumes for Children, like this very pretty Child Costume for Eleanor Roosevelt, First Lady. We can help you with any Historical Characters Costumes for Children & Adults. We have the clothing, wigs, hats, gloves and every imaginable accessory. We have plenty of American History Children’s & Adults Costumes. This Clara Barton, founder of the Red Cross, Civil War Nurse Costume is just one of the Famous American Women’s Costumes we have in stock, all year round. We have any Civil War Era characters, and period attire for any decade or any century of American History. Get complete outfits or just the pieces you need. Renaissance Kids Costumes & Costume Ideas are easy for you at Dallas Vintage Shop, like this Royal Renaissance Page Boy Costume. SCARBOROUGH FAIRE RENAISSANCE FESTIVAL is Weekends from 04/07 to 05/28, 2018 in Waxahachie, Tx. Come see us for all your Childrens & Adults Great Ren Fest Costume Ideas. We have Civil War costumes for children and adults in various qualities. We have loads of uniforms, sashes, officers hats, keppies, rifles, swords, flintlocks and more. Some authentic replicas or swords, pistols, buckles, insignias, belts, slouch hats with acorns and braids, keppis in wool and leather, jailer keys, bugles, powderhorns, jackets, etc. Dallas Vintage Shop is Dallas’ largest provider of children’s costumes for school projects, school historical costumes, and children’s theatrical costumes. We have everything you need. If you want complete outfits or just pieces of a costume or just accessories to complete an outfit you will find that we have the most amazing and diverse collection you could ever imagine. We have pioneer costumes and clothing, colonial clothing and costumes, pilgrim costumes, early American clothing and costumes, historical costumes, Thanksgiving and Christmas costumes. Any decade, any century, any social class and almost any budget.Dallas Vintage Shop can hook you up with costumes for Amelia Earhart, Abe Lincoln, George Washington, Benjamin Franklin, Abigail Adams, pilgrims, Martin Luther King, Barbara Bush, Sam Houston, Lewis and Clark, Sacajawea, Daniel Boone, Davy Crockett and any historical period or character you can imagine. You are in School Project Costumes category.